Fishing Bay Yacht Club is excited to announce that the offshore Opening Day evening festivities will be no cost to all members who sign up! Gourmet food stations including butlered service will serve delicacies such as fried oysters and crab cakes. Full menu here. Open bar will be provided. Welcome all racers, cruisers, their families, and guests to this family-friendly event to kick-start a great year of sailing! Planned format for PHRF SPIN, PHRF NON-SPIN, and CRUISING will be one medium distance race around government and drop marks. 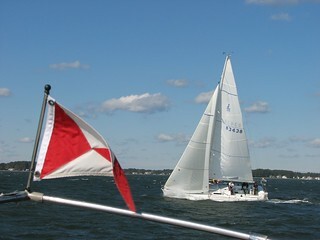 PHRF NON-SPIN will be sailed allowing only one (1) headsail downwind. PROGRAM On Saturday, April 13, the Blessing of the Fleet will begin at 1700 hours, followed by awards and refreshments provided by FBYC. Dinner and entertainment will begin at 1830 hours. SkipperS’ Meeting There will be a Flag Raising and Skippers’ Meeting at 0900 hours at the flagpole adjacent to the Jackson Creek parking lot to review any changes to the GSIs and SSIs for the offshore races.